Israel: The 8 acts remaining after the 6th qualifying round of “The Next Star 2018”. 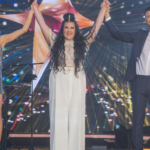 After the 6th qualifying round of Israel’s national selection, The Next Star 2018 , the list of remaining contestants cut down to the number of 8 competing acts. In this last 6th qualifying round a total of 9 acts competed to qualify to the next round. After the first episode of the show determing the first 7 acts, the last 8th contestants was chosen between the two left behind on the scoreboard. The 9 act performed well known songs before the public and a jury that consists of Static & Ben-El Tavori, Keren Peles, Harel Skaat and Assaf Amdursky. The act who was rated with the less positive votes was eliminated and sent home. The contestant that was eliminated in this last qualifying round was José Steinberg , who got only a 62% share of the positive votes. « Czech Republic: Mikolas Josef will fly to Lisbon with his song «Lie To Me».